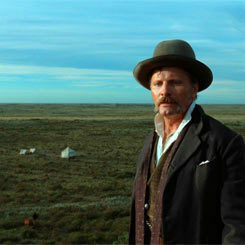 Lisandro Alonso’s Jauja (pronounced HOW-ha) marks multiple firsts in the Argentinian director’s career: working with another writer on the script, creating a period piece (late 19th-century Patagonia), casting a veritable star (and producer), Viggo Mortensen, and including more dialogue than all of his other films combined (though that’s not saying much, literally!). Jauja is unmistakably Alonso, with its focus on presence and duration in a solitary, dream-like journey through haunting landscapes. Mortensen stars as Captain Gunnar Dinesen, a Dane who travels with his fifteen year-old daughter to take an engineering job with the Argentine army during the Conquest of the Desert (the systematic annihilation of indigenous people in Patagonia). When the girl disappears into the night with her soldier sweetheart, Dinesen sets off into enemy territory to find them. The title evokes a beguiling mythic city perpetually sought by adventurers. Jauja (Trailer) from Cinema Guild on Vimeo.